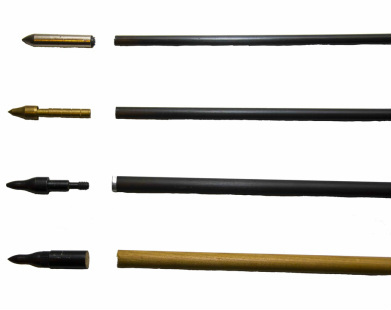 Shaft: the main body of the arrow. Tip/head: the heavy pointy bit at the front of the arrow. 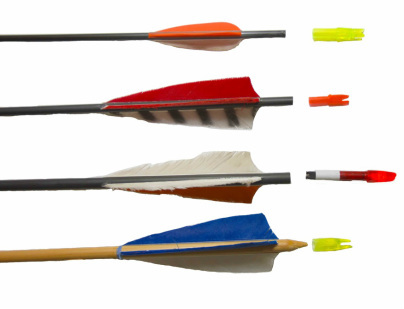 Special kinds of tips are used for competitive archery, hunting and games. Blunt: a tip for hunting birds. Since avian bodies are light, normal arrows pierce and exit them, sometimes without wounding. The blunt tip knocks the bird and breaks its flight. Foam: a large soft tip used for LARP (Life-Action Role Play), designed to inflict pain, but otherwise harmless. Comparable with paintball pellets. Fletching: the stabilizing feathers at the back of the arrow. While three feathers are most common, variants with two, four and six also exist. The feathers can be straight or curved to one side. The latter give the arrow a spin and stabilise its trajectory. Natural feathers have a better "grip" in the air and ensure a more stable flight. Most of the commercially available feathers are turkey flight feathers, taken from the tip of the wing or from the tail, where the feathers are large and strong. Plastic feathers are called "vanes" and are usually smaller than natural feathers. They allow the arrow to accelerate to greater speeds. Nock: the U-formed part of the arrow which slides over the string. It can be a part of the shaft, or it can be glued onto or into it. Some nocks have a battery and an LED and are excellent for night shooting. Nock point: the bottom of the nock which is pushed by the string during release. This is different from the nock point fixator, which sits on the string. Many people refer to both as a nock point. See the anatomy of a bow for more information. 1. Glue-on tip and a fiberglass shaft. 2. Glue-in tip and a carbon shaft. 3. Screw tip and a carbon shaft with a threaded insert. 4. Glue-on tip and a wooden shaft. 1. Plastic vanes and a push-on nock. 2. Natural feathers and a push-in nock. 3. Natural feathers and a Luminock (an LED in the nock provides light). 4. Wooden shaft, natural feathers and a glue-on nock.